You—or maybe one of your aunts—will probably be putting a version of these on top of a green bean casserole at some point over the coming week. Why not make your own? They're also good on sandwiches and burgers, and in any dip or casserole where an extra crunch is desired. In a heavy-bottomed frying pan or sauce pan, heat a 1/2-inch depth of oil over medium heat. 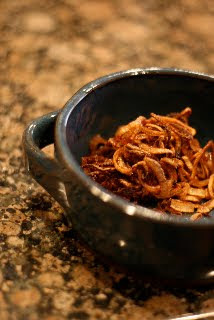 Add the shallots, stirring gently for about 8 or 10 minutes, until they begin to turn a golden-red color. Watch carefully because once they start to redden, they will easily brown and burn. Remove from the oil with a slotted spoon. Toss liberally with salt, and then let dry on a few layers of paper towel or a flattened out paper bag.